A street thriller of kidnapping, murder, trickery, and love that will have you at the edge of your seat. After 7 years of prison, multi-millionaire drug mogul Kane Garrett is back on the streets. But instead of diving back into the drug game, he’s teaching a college class, infusing business principles with his signature ruthless edge he developed in the streets. When a student―and heavy heroin dealer―named Basil catches Kane’s eye, Kane takes him on as a protégé and together, they build the biggest, smartest drug trafficking business the state has ever seen. But when Basil meets Moriah, Kane’s only daughter, lines get crossed and their dominant business union becomes a deadly rivalry. Welcome to a world where the kings meet their end and no one stays at the top for long. 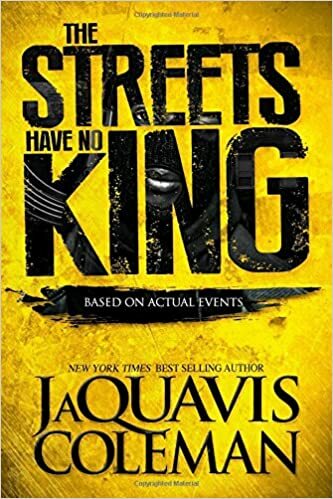 The crown always lies heavy on he who commands the streets―and Kane and Basil will fight to claim their rule, before power is toppled again, in The Streets Have No King by New York Times bestselling author JaQuavis Coleman. Skip by listening 👂 to book 📖 2. Just because I wanted to listen 👂 to Logan story. Dude is hilarious. Yes, this book was bomb yes, lol really good, has some good laughs throughout this book. Logan is hilarious. The whole Fallen Crest Series should’ve been about him lol. Or at least a series about him. I would’ve read that series. I want Nate to find love now since Mason and Logan have it. Can’t wait to read part 6 and 7 when it comes out I hope it is as good as 1-5 and this stand alone book about Logan, and Mason stands alone. Logan definitely was Logan Mutha ***** Kade lol. *** Machine lol. You know what? You’re right. I’m all those things. F-ck with mine, and I’ll f-ck you 10 times harder. Suspensions. Arrests. You think I care? You may think you know me…but she’s the only one who sees me.